MOSCOW, October 10. /TASS/. A Russian Sukhoi Su-24 bomber skidded off the runway during takeoff in Syria on Tuesday, killing the entire crew, the Defense Ministry said. The accident occurred at the Hmeymim air base, in the Latakia Governorate, when the aircraft was accelerating before takeoff. The jet was on a combat mission. "The plane’s crew failed to eject and died," the ministry said, adding that no damage on the ground was reported. A technical malfunction could have been the cause of the accident, it said. 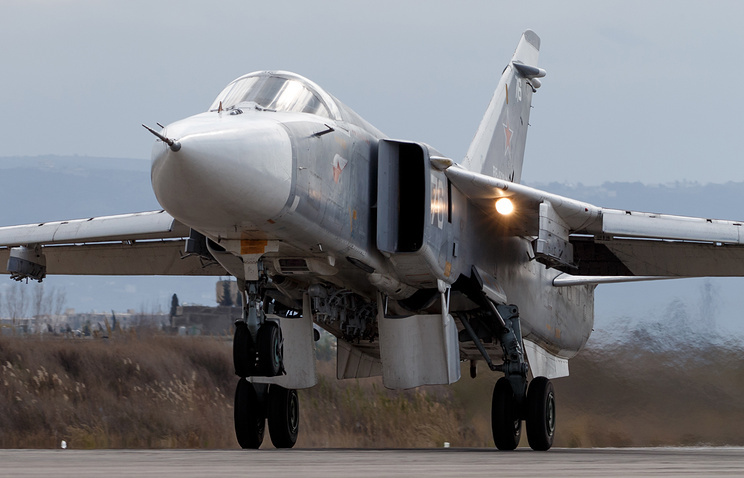 Russian military jets are based at the Hmeymim air base and carry out airstrikes against terrorists of the Islamic State and Jabhat al-Nusra groups (outlawed in Russia). Russian aircraft have been delivering up to 150 strikes per day against the militants near Mayadin in the Deir ez-Zor Governorate, the ministry said.